Fill out the form and choose the package that will be the best for you. If you decide to buy “Recommended Package – Muscle Development Stack”, you’ll get 1 pack free and save 35%! It’s only 1.31$ per day! 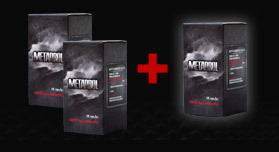 With a purchase of 1 or more packs of Metadrol, now you may add Ultra Slim System to your order. This new product will help you to shed extra kilos, without any side effects. The standard price of Ultra Slim System not covered by this special offer is 33 USD.